“The sky is the limit,” said Los Angeles County Sup. Hilda Solis last week during the closing of a five-week bioscience training boot camp at Cal State University, Los Angeles. She was referring to the intensive training, mentoring and business knowledge graduates of the LABioStart program received to help them start and sustain successful bioscience ventures. The event included an announcement by Cal State LA President William A. Covino that the university and Solis had reached an agreement to collaborate on initiatives to help spur interest in the bioscience industry locally by providing internships and professional development opportunities to students interested in the field. 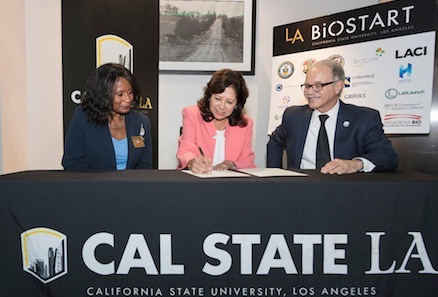 As part of the collaboration, the county will support the high school summer STEM academy Cal State conducts with Grifols Biologicals Inc., and the LABioStart program, according to the announcement. LA BioStart is funded by the U.S. Economic Development Administration. The program is a collaboration between Cal State LA, the Biocom Institute and the Los Angeles Cleantech Incubator (LACI). Training is offered at no cost and led by top industry experts who focus on critical areas such as business fundamentals, financing models, industrial research and development, regulatory affairs, leadership skills and communication strategies. Howard Xu is LA BioStart’s director and a professor of microbiology at Cal State LA. He said he’s “gratified” boot camp participants are benefitting from the program and that he’s looking forward to seeing the bioscience commercial products program they will launch in the future. Boot camp graduate and Cal State LA alumnus John Chi, founder and CEO of Synova Life Sciences in Alhambra, is commercializing a medical device to harvest stem cells from adipose tissues for use as a regenerative therapy for joints. According to Chi, the program “exceeded” all his expectations. There was “so much depth” in the real-world business knowledge shared by mentors and instructors, he said. Cal State LA Executive Vice President Jose A. Gomez called LA BioStart participants “pioneers” in the development of “Bioscience Valley,” which extends along Valley Boulevard and includes Cal State LA and Grifols Biologicals Inc. on the east, and USC’s Health Sciences campus on the west. Low-income students who graduate from Cal State University, Los Angeles are more likely to move up the income ladder then students at other universities, including some of the most elite private schools in the country, according to a recently released national study on student mobility. Cal State LA ranked number one in the study examining the role colleges and universities play in moving students up the income ladder. According to the study by The Equality of Opportunity Project, Cal State LA has propelled a higher percentage of students from the bottom fifth of income into the top fifth of U.S. earners than any of the other 2,000 colleges and universities in the study, including Ivy League schools. “This research confirms that Cal State LA provides a transformative educational experience,” said Cal State LA President William A. Covino in a statement following the publication of the study by the New York Times. The study’s authors included researchers from UC Berkeley, Stanford and Brown University, who said they based their findings on an analysis of anonymous tax filings and tuition records from the federal government following 30 million college students from 1999 to 2013. Researchers compared the incomes of college graduates in their 30s from low income families with that of their parents. The research focused on universities and colleges in the U.S. with more than 900 students born between 1980 and 1982 who attended school at some point between the ages of 19 and 22. Cal State LA’s mobility rate is 9.9%. Pace University-New York ranked second on the list with a rate of 8.4%. Cal State LA also scored well when examining the upward mobility of students from the bottom 40% of the income distribution to the top 40%. The university ranks sixth on that list, with a mobility rate of 35.7%, according to The New York Times. While highlighting the success of institutions like Cal State LA, the study also underscores the need to study the means by which high mobility rates are achieved. 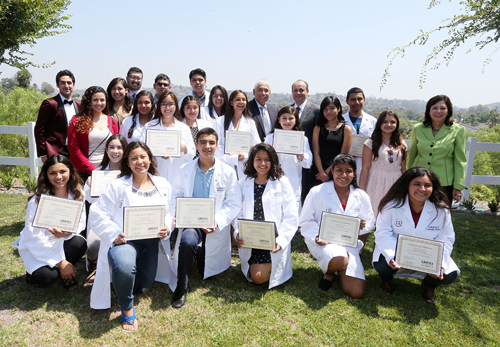 No they are not doctors, but twenty students from Garfield High School were presented with white lab coats following their completion of a two-week Grifols Summer Science Academy at ?Cal State LA. The students were also presented with certificates denoting their program participation during a formal ceremony earlier this month attended by County Supervisor Hilda Solis. During the academy, students participated in a number of sessions that focused on microbiology and molecular work. The lab and research experience exposed these students to STEM-related careers and prepared them to succeed in college. The final day included a luncheon, student presentations, and a tour of Grifols Biologicals Inc.
Cal State LA has been designated by the National Science Foundation as the top baccalaureate institution of Latino science and engineering Ph.D. recipients among all predominantly undergraduate and master’s degree colleges and universities in the continental U.S.
Grifols is an international firm that develops plasma medicines, diagnostic systems and hospital pharmacy products. Its U.S. headquarters is adjacent to Cal State LA and employs about 1,000 people. Roughly 100 of the employees are alumni of the University. 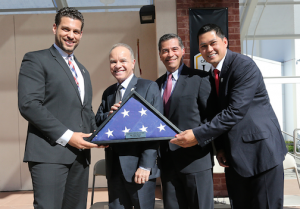 “Veterans have made sacrifices on behalf of all Americans and their service should never be forgotten,” Rep. Xavier Becerra said Tuesday during a ceremony honoring student veterans at Cal State LA where he presented a flag that flew at the U.S. Capitol. “It’s a privilege and an honor to be able to present this flag to all those warriors who are here at Cal State LA,” said Becerra, whose 34th Congressional District includes Eastside neighborhoods served by the university. The flag was accepted by senior Thomas Lawson, a Navy veteran and president of the Cal State LA Student Veterans Organization. 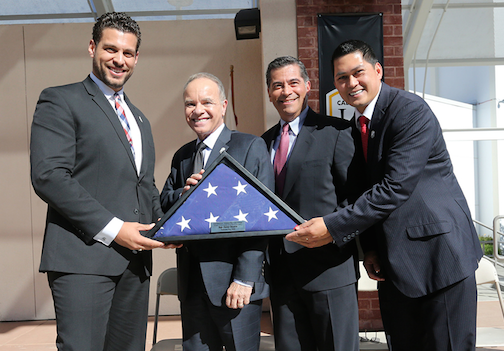 Left to right: Cal State LA student veteran Thomas Lawson, President William A. Covino, Rep. Xavier Becerra and alumnus and veteran Louis Guan with flag presented to the University by Becerra. Cal State LA President William A. Covino said the university owes a debt of gratitude to veterans. 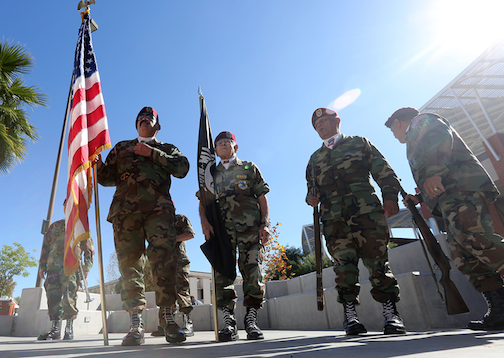 More than 500 veterans are enrolled at Cal State LA, which has been recognized by US News & World Report as one of the best public universities in the West for veterans. The University’s Veterans Resource Center, which sponsored the ceremony, specializes in offering academic support counseling, peer counseling and other services to student veterans. The ceremony began with a moving rendition of the Star Spangled Banner by veteran and Los Angeles County firefighter Humberto Agurcia. The Valley Veterans Memorial Team, which is composed of local veterans, presented the colors. El Instituto de Verano Nacional de Mariachi en su cuarta edición se llevó a cabo en Cal State LA del 5 al 8 de agosto atrayendo a 175 jóvenes intérpretes de mariachi de familias de bajos ingresos en todo el país. Ningún estudiante se le fue negada la asistencia al instituto por falta de recursos económicos. Los niños y jóvenes estudiaron la música tradicional mexicana bajo la tutela de artistas y educadores de mariachi reconocidos a nivel nacional como José Hernández y el Mariachi Sol de México. 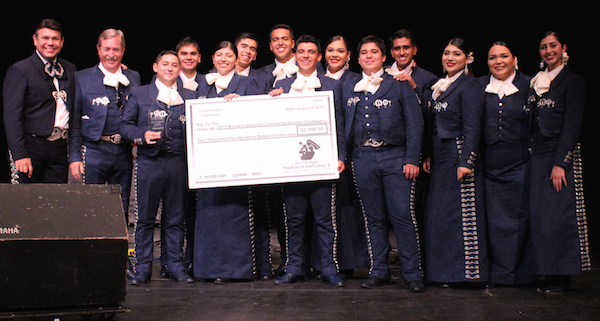 La banda ganadora del primer lugar fue Mariachi Estrellas de Chula Vista, quienes recibieron $2,500 y el segundo lugar fue el Mariachi Juvenil Alma de México de San José, ganadores de $1,500. 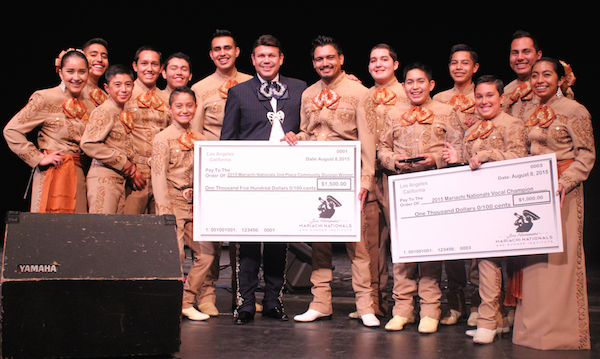 Joe Fata, de 11 años de edad, de Mariachi Juvenil fue el vocalista ganador de un premio de $,1000. Cerca de 200 atletas, entrenadores y personal de la delegación alemana llegaron a Cal State LA el martes por la tarde para hospedarse por tres días y entrenar antes del inicio de las Olimpiadas Especiales el 25 de julio. Los anfitriones del la delegación alemana son Lincoln Heights, Monterey Park y Alhambra. El miércoles por la mañana el equipo alemán comenzó su practica en la cancha de futbol, mientras otros atletas ocupaban el gimnasio y la pista de carreras. El viernes a las 11am en el gimnasio de Cal State LA se llevará a cabo una celebración pre-comienzo de las Olimpiadas Especiales y para desearle buena suerte al equipo alemán. Two males, one 14 and the other 18, were shot and wounded in a parking lot at Cal State Los Angeles Sunday. Teens inside a van that made its way through an area east of downtown Los Angeles taunted people as they went and when they drove into a parking lot at the university about 9:15 p.m. someone fired on the vehicle, striking the victims, said Lt. Peter Gamino of the Los Angeles Police Department’s Hollenbeck Station. Both were taken to County-USC Medical Center, he said. Their conditions were not immediately available. University police were investigating the shooting, which appeared to be gang-related, Gamino said. No suspect information was available, he said. A panel discussion on the relevance Mexican American journalist Ruben Salazar’s life and work has in today’s society will take place Feb. 4 at Cal State University, Los Angeles. Titled “Rubén Salazar – Siempre Con Nosotros/Always With Us,” the discussion is being presented in conjunction with the multimedia exhibition, “Legacy of Rubén Salazar: A Man of His Words, a Man of His Time,” on display through March 26 at the University’s John F. Kennedy Memorial Library. Next Wednesday’s panel will be led by noted history and journalism scholars, Mario Garcia, Ph.D, who has published works on Mexican American and Chicano activism and Latino millennials, and Felix Gutierrez, Ph.D, who has written and spoken extensively about the biases of mass media and the need for diversity in journalism. Panelists will speak to the importance of principled journalism in today’s polarized society, using the life and writings of former LA Times and KMEX-TV Spanish language news reporter Ruben Salazar as context. 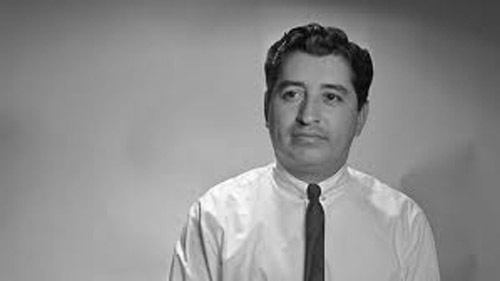 Salazar, perhaps best known for his death at the hands of Los Angeles County Sheriff’s Deputies during the 1970 Chicano Moratorium, was at the forefront of principled journalism during another period of polarization, the 1960’s civil rights and anti-war movements. He was a nationally recognized foreign correspondent who reported on the escalation of the Vietnam War and on Latin America during the beginnings of the post Cuban revolution. When he returned to Los Angeles in 1969, he found a community in transition, fighting to be empowered. 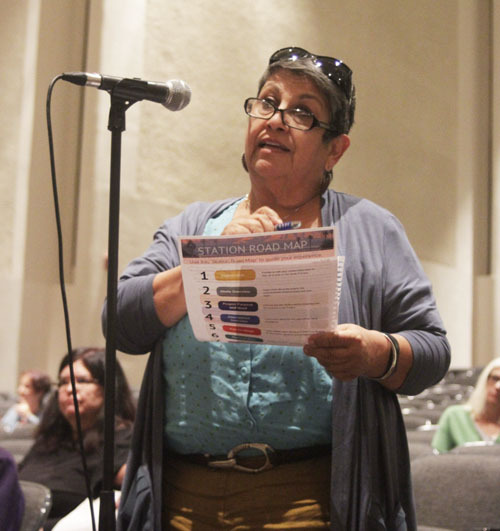 Salazar’s in-depth reporting of the Mexican American and emerging Chicano movement for the Times and KMEX in many ways gave voice to that struggle, presenting leaders and common people as subjects, not objects, or stereotypes for mainstream media sound bites. Early in his career, while covering jail conditions in El Paso, he was arrested while posing as a drunk and went on to describing life in the tank. One of his last columns before being killed, in moving detail described the plight of welfare mothers and children. Salazar covered action on the front lines in Vietnam, the Tlateloco massacre in Mexico at the time of the 1968 Olympics, and he wrote about the beginnings of Cesar Chavez’ farm labor organizing before the strikes and boycotts. He also wrote about Chicano teacher Sal Castro years before he emerged as a major figure in the East LA Walkouts. Salazar’s tragic death cemented his place as an icon of the Chicano Movement. His return to Los Angeles in 1969 marked the establishment of the Mexican American/Chicano news beat, journalism to empower people. 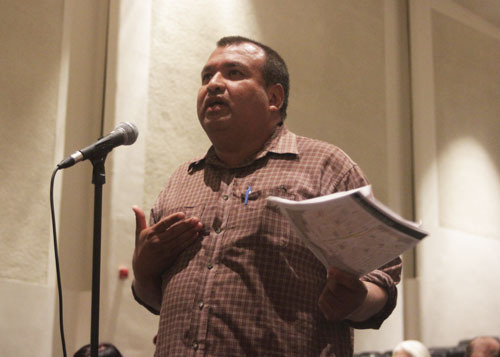 In the year before he died, Salazar wrote over 100 articles on a wide range of issues from the barrios and fields in and around Los Angeles and nationwide. The panel discussion will be held at 3pm, Feb. 4 in the Golden Eagle Ballroom 2, in the Student Union building. 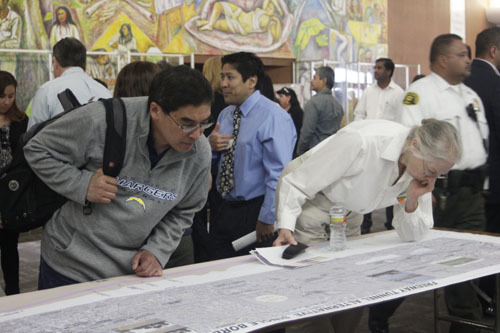 To attend, RSVP by Feb. 2 at http://www.calstatela.edu/events/ruben-salazar. For more information, call (323) 343-3066 or send an email to events@calstatela.edu.